Camogli is a fishing village and tourist resort located on the west side of the peninsula of Portofino, on the Golfo Paradiso in the Riviera di Levante, in the Metropolitan City of Genoa, Liguria, northern Italy. Satisfy your inner culture vulture at Castello Brown and Albertis Castle. You'll discover tucked-away gems like Faro di Portofino and Santissima Annunziata del Vastato. Explore Camogli's surroundings by going to Genoa (Galleria Nazionale di Palazzo Spinola, Basilica di Santa Maria di Castello, & more). There's more to do: appreciate the extensive heritage of Passeggiata Anita Garibaldi a Nervi and take in the spiritual surroundings of Church of San Giorgio. Houston, USA to Camogli is an approximately 21-hour flight. The time zone changes from Central Standard Time to Central European Time, which is usually a 7 hour difference. In June, Camogli is slightly colder than Houston - with highs of 76°F and lows of 67°F. Wrap up your sightseeing on the 9th (Sat) early enough to drive to Porto Venere. Visit Convento dei Cappuccini e Chiesa di San Francesco and Chiesa di San Lorenzo for their historical value. Satisfy your inner culture vulture at Isola Palmaria and Cinque Terre Trails. 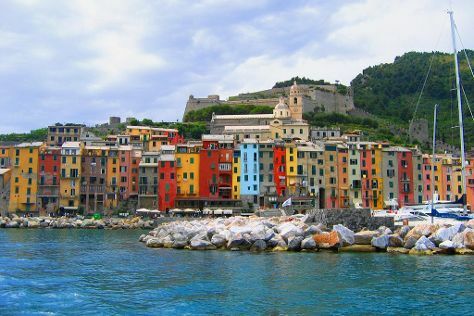 Change things up with these side-trips from Porto Venere: Footpath Monterosso - Vernazza (in Monterosso al Mare) and Santa Margherita di Antiochia Church (in Vernazza). Traveling by car from Camogli to Porto Venere takes 1.5 hours. Alternatively, you can do a combination of train and bus. In June, plan for daily highs up to 79°F, and evening lows to 64°F. On the 12th (Tue), you're off tohome.